Information about Linda Walter is scarce. What is known about her comes from several newspaper and magazine mentions. Two 1942 issues of New Horizons named her. Page 42: Most appropriate reference was a cartoon drawn for The Saturday Evening Post by Linda Walter, whose caption pointed up the air-mindedness of the younger generation (see cut). 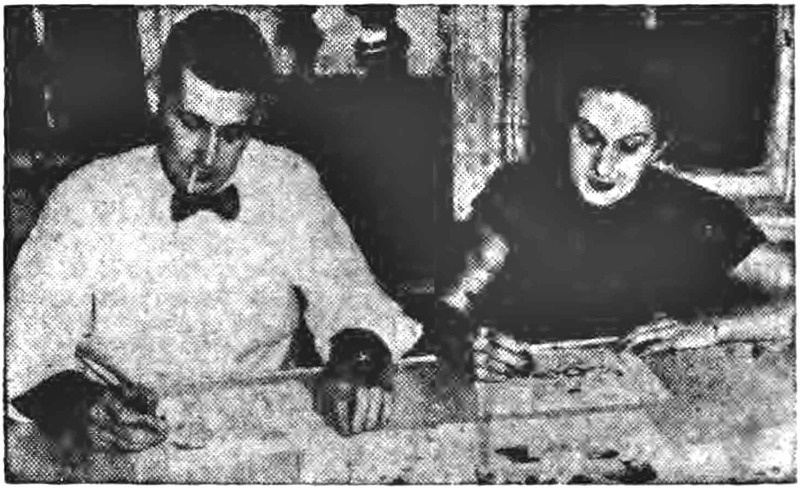 The Kingston Daily Freeman, December 20, 1951, publicized the upcoming exhibit. Woodstock, Dec. 20—An Illustrators’ Exhibit will open Friday, Dec. 21, at the S S Sea Horse, with a reception from 6 to 8 p. m. Hot hors d’oeuvres will be served by C. J. McCarthy. The paintings, drawings and sketches of the following illustrators will be shown: Ethel Adams, Jay Allen, Charles W. Chambers, Heine Drucklieb, Harvey Emerich, Anton Otto Fischer, George Green, Gerald Green, Karl Hubbell. Dave Huffine, William H. MacReady, C. J. McCarthy, John McClellan, Joseph Morgan, John Pike, Pamela Ravenel, John Striebel, Dudley G. Summers, Harry Temple, Mark Von Arenberg and Jerry and Linda Walter. The Kingston Daily Freeman, August 18, 1954, reported the benefit for the Woodstock Recreation Field. One paragraph included the following. A colorful feature of the carnival will be the silk screened admission tags, designed by 18 famous artists, autographed and available for 25 cents apiece. Each one a collector’s item, entire sets may be purchased. The artists who are now working on the tags are as follows: James Turnbull, Howard Mandel, John Pike, Edmond Good, Karl [sic] Hubbell, Anton Refregier, Linda Walter, Dave Hufflne, Ethel Magafan, Edward Chavez, Miska Petersham, Lucil Blanch, Phoebe Towbin, Marianne Appel Mecklem, Reginald Wilson, Jay Allen, Edward L. Chase and John Striebel. Jerry and Linda Walter are an attractive young couple who can pinch-hit for each other in turning out the feature. Jerry normally dreams up the gags and Linda does the art work, but they can switch about when the occasion demands. Married shortly before Pearl Harbor, the Walters worked for an advertising agency before Mr. Walters [sic] became a navigator for the Atlantic Transport Command. After the war, they dreamed up Susie and have had a highly popular gal on their hands ever since. At Ancestry.com the New York, New York, Marriage License Indexes recorded the issuance of a license to “Ethelynde Stimpson” and “Harold F. Walter” on October 2, 1940. (Jerry’s birth name was Harold Frank Walter.) Ethelynde could be Linda. Looking at census records, Ethelynde was born around 1918 in New Jersey and her parents were William and Ethelynde. They lived in New Castle, Westchester County, New York in 1920. The 1930 and 1940 censuses said Ethelynde resided in Cranford, Union County, New Jersey. According to the 1940 census, Ethelynde was a secretary at a welding and metal company. American Newspaper Comics (2012) said Linda and Jerry (under the name Frank Walter) also created Jellybean Jones for King Features Syndicate and The Lively Ones for Newsday Specials. The Social Security Death has a “Linda Walter” who was born January 18, 1918 and died March 28, 2009. Her last known residence was Lake Hill, Ulster County, New York, which is about fives miles/8 kilometers west of Woodstock.